After getting through all the storms winter threw at us, it looks as if spring is finally here. We know this to be true because, after finishing a hard day’s work in our dusty office, we peer through the window and it’s still light. 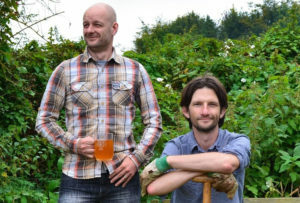 It won’t be long until we’ll be eating evening meals outside and hanging around for a cider or two, admiring the blossoming fruit trees and twitching with frustration at the wobbly lines our carrots have formed in the raised beds. But until we go fully al fresco there’s an important spring activity that needs to be undertaken: the patio is a mess of mud, slime and plant debris and in need of a proper clean. 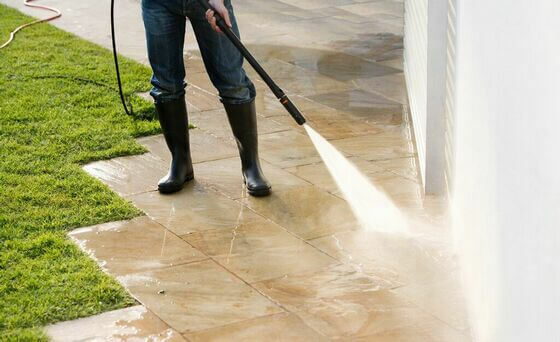 It can be tempting to simply wheel out the pressure washer and have a blast, but for well-used patios and paths there are a few other tasks to be done that will make the scrubbing that little bit more thorough. Here are our top tips for patio perfection. Much like vacuuming the living room, it can be tempting to simply clean around the furniture, but just as piles of dust have a habit of collecting beneath the sofa, so dirt and grime gathers at the feet of garden chairs. Lift a large pot and you’ll probably find mounds of muck stuck to the slabs. Don’t take the obvious shortcut – move all the patio fixtures out of the way and consider giving them a scrub while you’re at it. You’ll almost certainly find yet more dirt between patio slabs, often allowing plants to grow from seeds that have taken up residence. This all needs to go, otherwise when you clean you’ll constantly be smearing the mud from the cracks back over the patio. 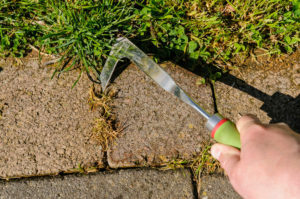 There’s a tool designed especially for this chore, a simple L-shaped device known as a ‘block paving knife’ which can slice through weeds and flick the dirt out of those tight spaces. Now sweep up all those bits of flicked-up matter, and any other leaves or twigs that might be scattered around, and chuck them away. It’s also worth having a general rake and sweep of the patio’s surrounding area as, even in the most pleasant of Springs, there will always be at least one windy day that will whip up the debris and undo your hard work. 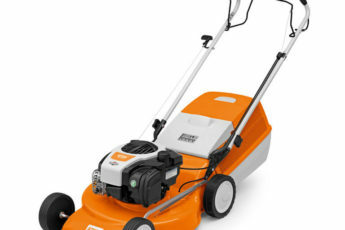 And if your lawn goes up to the edge of your patio, tidying up the edges with a cutting tool wouldn’t go amiss. 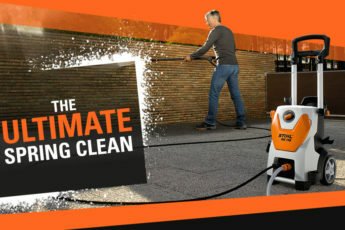 Now you’ve cleared the area you’re ready to engage the pressure washer in action. 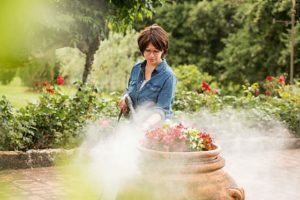 That jet of water comes out with a big blast of force behind it, so don’t be tempted to aim at neighbouring rickety greenhouse windows while you’re in the cleaning groove as there’s every chance you’ll also be sweeping up broken glass. For a proper scrub enlist the services of some universal cleaner, then take aim and say goodbye to the dirt. If you’re not in possession of a pressure washer then all is not lost, but you’ll need to go down the more labour intensive route of scrubbing brush, bucket of soapy water and hose pipe. Before returning the furniture, it’s worth checking to see if any cracks between the slabs need filling – deep gaps will let in more dirt and water which risks longer-term damage. Pre-mixed joint fillers are available to make things easy, or you can fill with a mix of sand and cement – this can be applied as a wet mix or you can make a dry mix and fill on a dry day then firm it in place and spray with a fine mist of water. Finally, move your pots, chairs and tables back in place and, to celebrate your cleaning achievement, treat yourself to some new patio plants. This year we’re going for the simple, bright pleasures of Pot Marigolds – easy to grow blooms that will radiate with golden hues across your sparkling clean patio. Have you cleaned your patio yet this year? 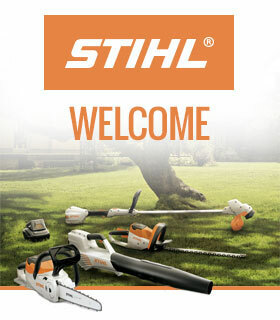 What other cleaning jobs have you attempted in the garden? Share your story in the comments. Don’t forget for those of us with block paving to sweep kiln dried sand back in to the gaps once the paving has dried fully! Thanks for the tip Simon! 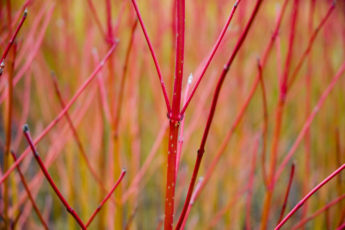 Those pesky gaps can be a great home for weeds too, if they aren’t filled!